Just near the lights on Molesworth Road you will find A&E often with a van outside loading stuff into the shop or taking it out for a delivery elsewhere. Some of the goods will be out on the pavement during the summer so that you have a chance to see what has just come in. If you are after a new table or a set of chairs for not much money then this is the place to start. From a very unassuming front entrance, the shop opens up into a number of rooms that house both furniture, decorative items and a wide range of appliances. These include cookers, fridges microwaves and washing machines. Home delivery can usually be arranged for a minimal charge and in the knowledge that all the goods have been tested and refurbished where necessary, you can be sure of getting a bargain. 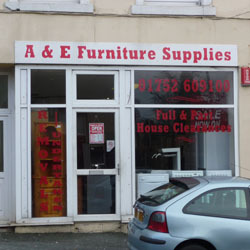 Another service that A&E provide is house clearances. If you need to clear a house for any reason, whether as part of moving , probate or for landlords who are changing tenants, then A&E can help you out. They will give you a quote to do the job abd may purchase that things you no longer require. So, give them a call if you need this kind of help.